The Sensor Pro Board (the “SensorPro”) is an electronic circuit board that allows NXT users to efficiently and easily use sensors that are not offered by Lego with their FTC robot. It consists of a HiTechnic SuperPro Prototype Board , an Arduino Nano, a built-in gyro sensor, and pins that allow for additional sensor attachment. Before the SensorPro, FTC teams had to either use existing sensors or use the HiTechnic board to create interfaces for new or custom sensors. 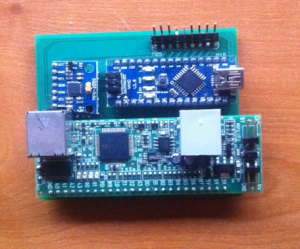 While many teams used the HiTechnic board, one of its major drawbacks was the lack of I2C interface to modern sensors. The goal of this project was to allow I2C-based sensors to be used easily while allowing non-I2C sensors to still be used with the HiTechnic board. The SensorPro has qualified for finalist in the Young Minds Awards! The winners will be announced in early November.